Turkey Stuffed Peppers combine ground turkey, tons of vegetables, and pepper jack cheese into a satisfying healthy low carb meal. Jump start your healthy eating habits with these oh-so-delicious stuffed peppers! I’m always looking for meals that not only taste amazing and are packed with flavor, but finding low carb options – especially this time of year – is always a huge bonus when I’m really trying to watch what I eat. These stuffed peppers are very similar to my classic stuffed peppers, but that recipe uses ground beef and rice along with all the other ingredients. 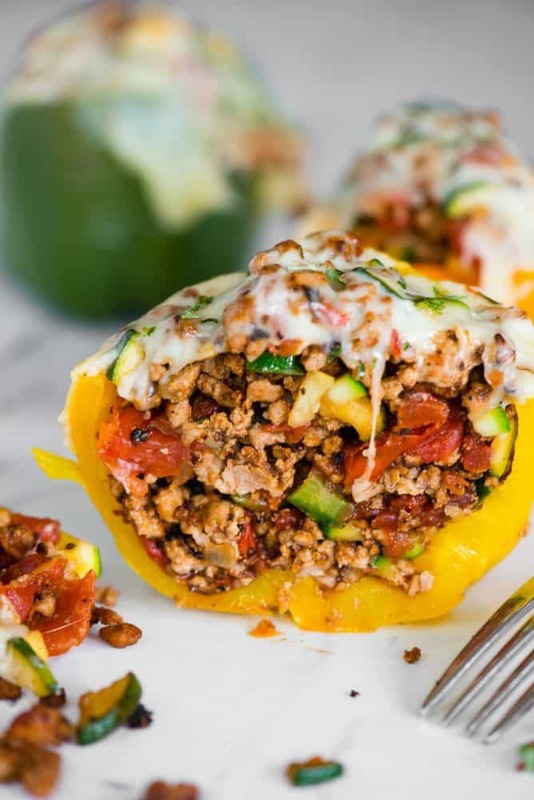 I do find that adding rice or quinoa to a stuffed pepper makes it more filling and it feels more like a complete meal, but I also know a lot of people are searching for grain free or low carb recipes. That’s why I wanted to create a stuffed pepper recipe that was basically meat, cheese, and veggies. First step is to par bake your peppers. The reason you want the peppers partially cooked is because you will fill them with cooked hot filling. By pre-cooking the peppers, everything will be perfectly cooked by the time you’re ready to serve. To make the stuffed pepper filling, simply start by browning the ground turkey. After a few minutes you’ll add some onion, garlic, and any remaining pieces of bell pepper. Let those turn golden brown and completely fragrant. To that mixture, I add diced zucchini, diced tomatoes, and season it with salt and pepper. To assemble the turkey stuffed peppers, simply pack the hot peppers with your filling, top with cheese, and finish them off in the hot oven to melt the cheese. 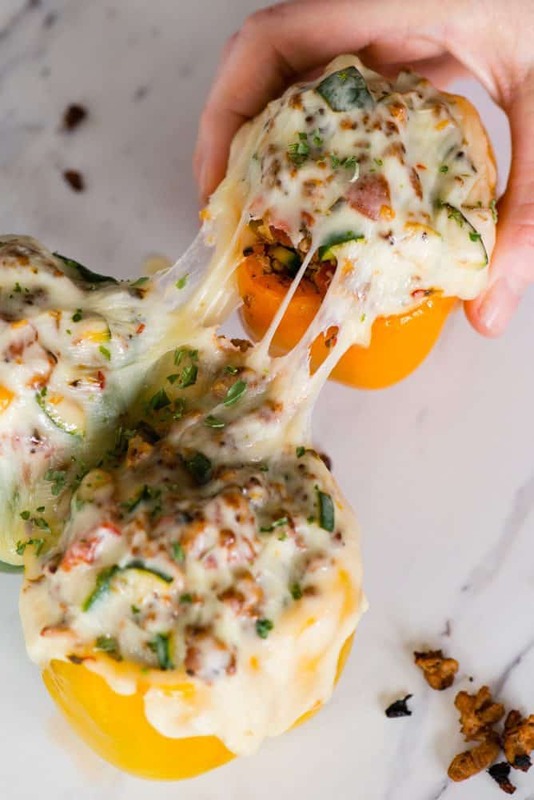 You can choose any kind of cheese that you like, or completely omit if you need a dairy free stuffed pepper, but my preference is to use pepper jack. I prefer to use ground dark meat because it has more flavor, but you can also use ground white meat. Instead of using ground meat at all, you can also use diced cooked turkey and add it to the mixture after the vegetables have sauteed for a bit. That would be a great option if you’re looking for a post-holiday leftover turkey recipe. You can also change up the vegetables you add to your stuffed peppers. Instead of tomatoes you could add some baked butternut squash and sage – both of which go fantastic with turkey. Turkey stuffed peppers are also a great recipe to make on the weekends if you are looking for healthy meal planning options. They are great to pack in work lunches throughout the week! 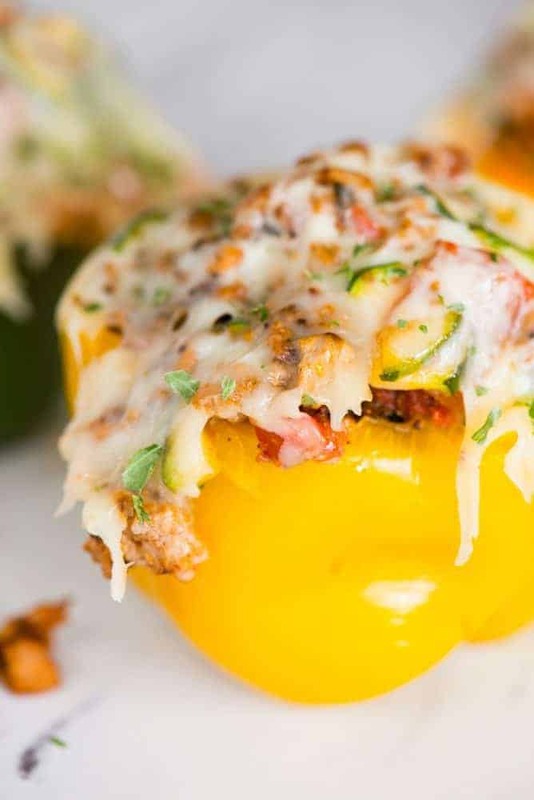 Turkey Stuffed Peppers combine ground turkey, tons of vegetables, and pepper jack cheese into a satisfying healthy low carb meal. 4 slices pepper jack cheese. To prepare the peppers, slice the tops off and remove any veins or seeds inside. Do not discard tops as you will use any remaining pepper attached to the stem. Add peppers to a casserole dish, fill with about ½ inch of water, cover with aluminum foil, and bake in a 425 F oven for 20 minutes in order to steam, or parbake, the peppers. While the peppers are steaming, cook the ground turkey, onion, garlic, and any remaining pepper from the stem piece (diced) in a large saute pan over medium high heat until the meat is crumbly, about 10-15 minutes. Add the diced zucchini and allow to cook for 1-2 minutes. Stir in the tomatoes. Add salt to taste. Remove from heat. Once peppers are done, remove from oven, discard water, and return peppers to casserole dish. Fill each pepper cavity with the ground turkey filling until all of the peppers have been evenly filled. Top with pepper jack cheese. If making ahead, store in airtight container in the refrigerator until ready to heat and serve. Return peppers to oven and cook until heated through and cheese has melted. This should only take a few minutes. I love turkey, and this stuffed turkey recipe is looking yummy. I will try that and check how it feels to eat..